Home Fat Butter AND NOW FOR A LITTLE GOOD NEWS: BUTTER IS BACK! Joe Ortner performs maintenance on a robotic palletizer at Grassland Dairy Products Inc. in Greenwood, the largest family-owned butter producer in the nation. Picture by Mark Hoffman. The headline in the Milwaukee Journal Sentinel proclaims, U.S. butter consumption reaches highest level in 40 years. Joe Taschler reports, “Butter is back. Driven by the movement toward food that contains natural ingredients as well as the foodie and gourmet cooking trends, butter consumption in the United States has reached its highest level in 40 years, dairy industry leaders say. Where margarine and other spreads were once hailed as healthier alternatives to butter, the pendulum may have swung back in butter’s favor. 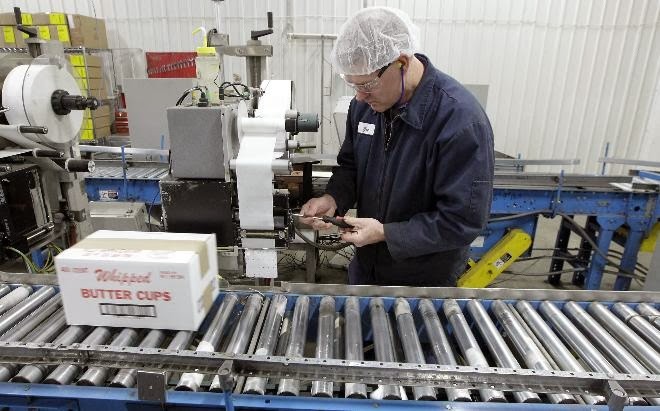 That matters in Wisconsin, where nearly 12,000 dairy farms and their 1.3 million cows annually produce 3.2 billion gallons of milk, the raw material for butter.” Read more here. As usual, the story includes a disclaimer, just to be sure we don’t think we can eat as much as we want: “…That doesn’t mean you should gobble down a stick of butter for breakfast every morning. Butter should be consumed in moderation as part of a balanced diet, dairy experts say.” Well, we all know where listening the experts has gotten us in the last 40 years. According to the Milk Producer Federation, butter consumption reached 5.6 pounds per capita in 2012, up from a low point of 4.1 pounds in 1997. That’s still very low, compared to the amount of butter eaten in traditional herding societies, like India and Ireland, where butter was the staple food. The Irish who lived in the area around Cork are said to have eaten an average of 365 pounds of butter a year; that’s a pound of butter per person per day! The area was known for its rich, life-giving butter, churned from the milk of pastured cows eating lush green grass. Ireland has a long history of butter-making going back to prehistoric times. Ancient bog butter is still frequently discovered in Irish bogs, where it had been packed in wicker baskets and buried to keep it fresh or to hide it from invaders. Some has been dated as being three thousand years old. An account of Irish food written by Thomas Dinely in 1681 suggests another reason for the burial of butter, that it produced a kind of butter made for special occasions. He wrote, “Butter, layed up in wicker baskets, mixed with a sort of garlic and buried for some time in a bog to make a provision of a high taste for Lent.” This allowed time for the flavor to evenly penetrate the fat. Burial in a bog would keep the butter as cool as possible, while the exclusion of air and the antiseptic qualities of the turf would prevent mold growth. 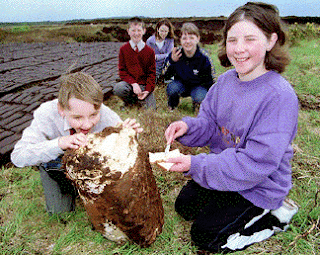 Children test 300 year old bog butter found by turf cutters at Poll na gCapaill Bog, Co Galway in May 1999. Photograph: Ray Ryan. Butter contains mostly saturated fat (66%, the rest monounsaturated), but it was the confusion of all solid fats with artificial trans fats that led to the erroneous belief that butter clogged arteries and contributed to heart disease. Trans fats are the real villains and butter is actually very good for us. It contains fat-soluble vitamins A (retinol), E, K, and D. (The fat-soluble vitamins in fat-free milk are useless unless accompanied by a source of fat.) Butter is rich in minerals, including manganese, zinc, chromium, iodine, and especially selenium. It is a source for antimicrobial, anti-fungal, and anti-carcinogenic fatty acids; it strengthens the immune system and provides protection from heart disease. osteoporosis, and mental illness. Researchers at Harvard’s Joslin Diabetes Center found that the brains of those with diabetes suffer from a LACK of cholesterol. The brain contains more cholesterol than any organ in the body. It is essential for normal brain function and most of it is made within the brain. According to C. Ronald Kahn, M.D., it is a lack of cholesterol that leads to the neurologic and cerebral complication of diabetes, including cognitive dysfunction, depression, and an increased risk of Alzheimer’s disease. Cork Butter Museum, Herding Societies. Bookmark. The Nordic Food Lab blog is fascinating. Unfortunately, the only way to follow it is to subscribe to their twitter feed. Thanks for the link, Andrea. I'll check it out.